Architect and treehouse-master Antony Gibbon's latest creation is called Inhabit Ground. Gibbon’s new shelter consists of two identical gable-roofed cabins connected by a central volume. This in-between space, where the entrance is located, features floor-to-ceiling sliding glass doors. The transparency of its skin lets the sun in while also providing cross ventilation. The space on one side is designed to accommodate a double bedroom and bathroom; the space on the opposite side is planned as a lounge area or as an extra sleeping room. Gibbon told Inhabitat that the original Inhabit Tree House is almost complete in New York. We can’t wait to see the outcome. It offers an alternative to his previous Inhabit Treehouse as it rests on the ground. It consists of two identical gable-roofed cabins connected by a central volume. This in-between space features floor-to-ceiling sliding glass doors and has rooms at either side. Anthony Gibbons also created the Inhabit treehouse. 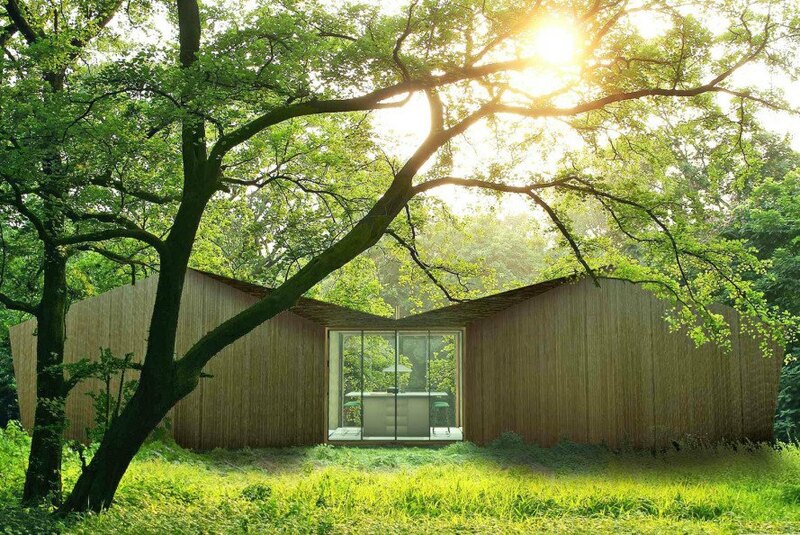 "Inhabit Tree House was inspired by geometric Forms. Can be constructed in any environment whether it be in the Forest, Mountains or over rivers & Lakes." Inhabit is "available in various sizes and variations in Design: built in the trees or on the ground. Able to sleep 2 - 4 people depending on the clients needs." "The outer structure is finished in a cedar cladding that will age with time allowing the Inhabit to blend in with the natural surroundings. 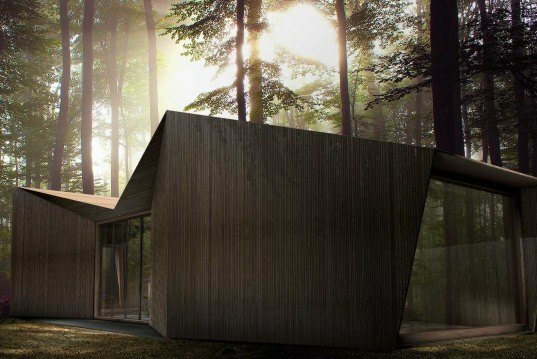 The large open windows are designed to let as much natural light into the Interior when in densely forested areas as well as to enjoy the views of the surrounding Nature."